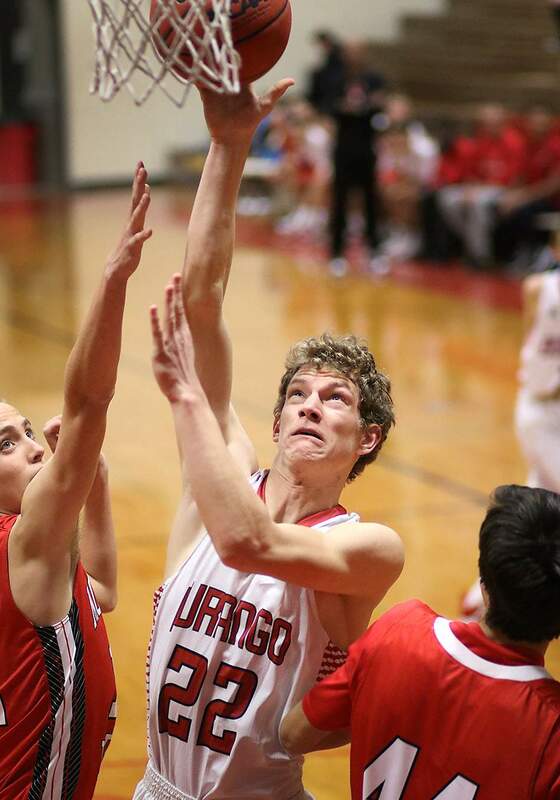 Martin Cuntz of Durango High School puts up a shot on Saturday while playing Montrose High School at DHS. Al Hurworth of Durango High School puts up a shot on Saturday while playing Montrose High School at DHS. Jordan Woolverton of Durango High School puts up a shot on Saturday while playing Montrose High School at DHS. Clay Seibel of Durango High School brings the ball down the court on Saturday while playing Montrose High School at DHS. Cullen Robinette of Durango High School drives to the basket on Saturday while playing Montrose High School at DHS. 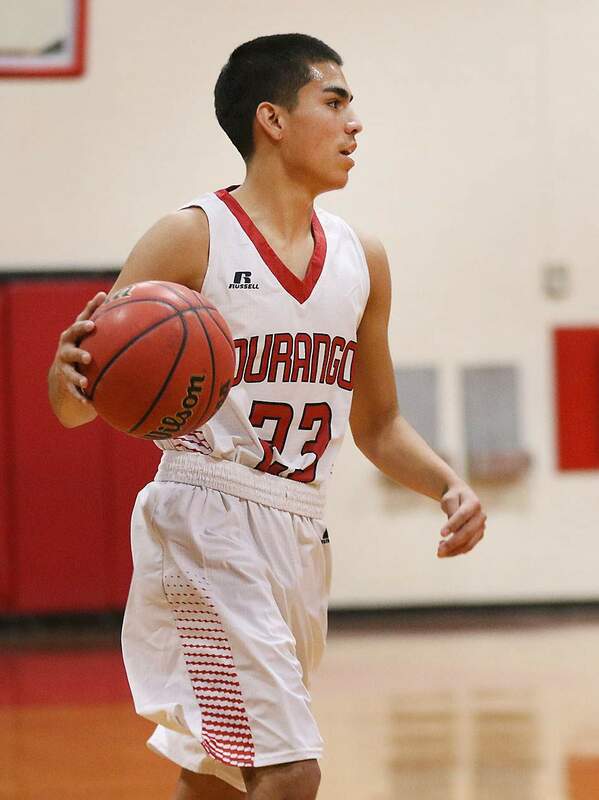 The Durango High School boys basketball team was down just one point with just under four minutes remaining against Montrose in Saturday afternoon’s contest at DHS, when a slew of turnovers turned the game on its head. Montrose point guard Sean Alex stole a pass, and was intentionally fouled while he tried to drive to the basket. 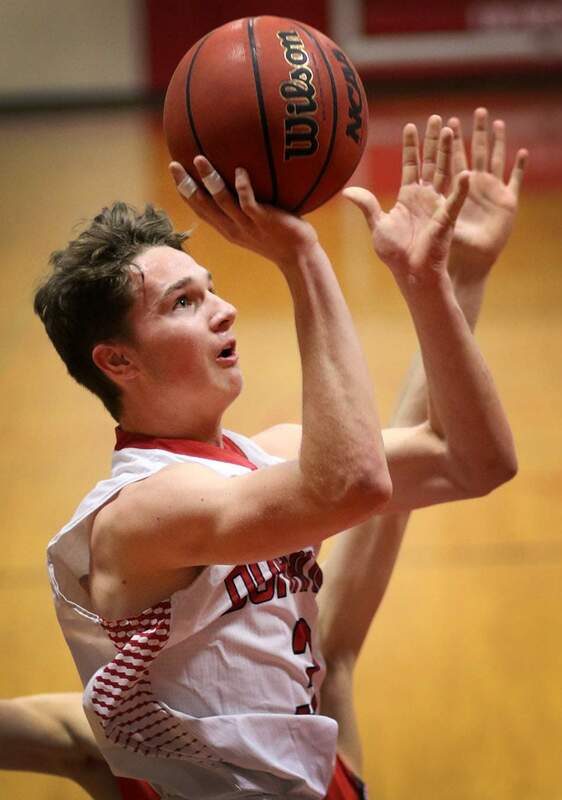 He converted the free throws and Montrose saw a 1-point lead expand and went on a late 7-0 run to close out Durango’s chances, as the Indians won, 48-41. Montrose head coach Ryan Voehringer thought his team’s defense down the stretch changed the momentum of the game. 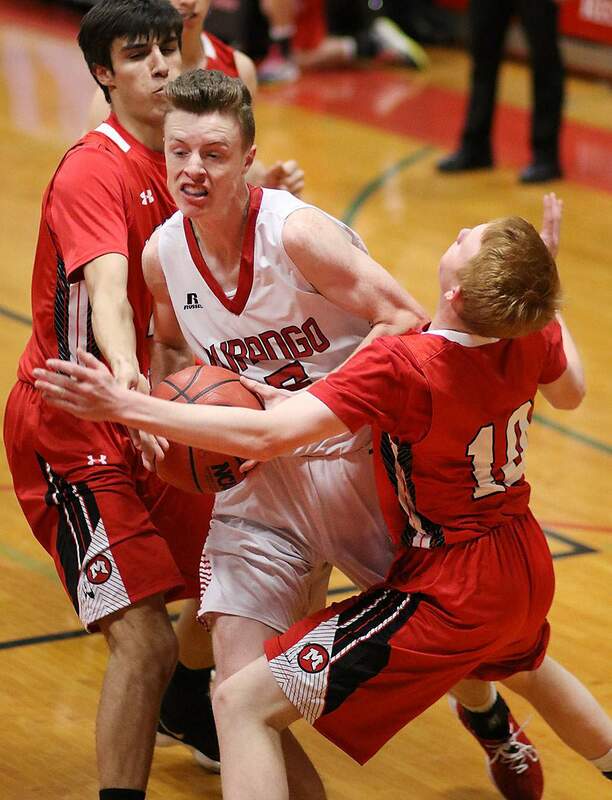 Durango (8-8, 1-2 5A/4A Southwestern League) had plenty of chances to keep the game a one-possession game, but the Demons committed three key turnovers down the stretch and were unable to execute the big plays until it was too late. The Demons fed forward Martin Cuntz, who had a team-high 14 points in the loss, while fellow forward Al Hurworth had a quiet eight points. Hurworth, Cuntz and freshman Anthony Flint were the only players who scored in the fourth quarter. Durango’s defense was unable to get the stops needed on multiple occasions, as the Indians closed the first half and scored on all five of their final possessions, and took a 26-24 lead at halftime. 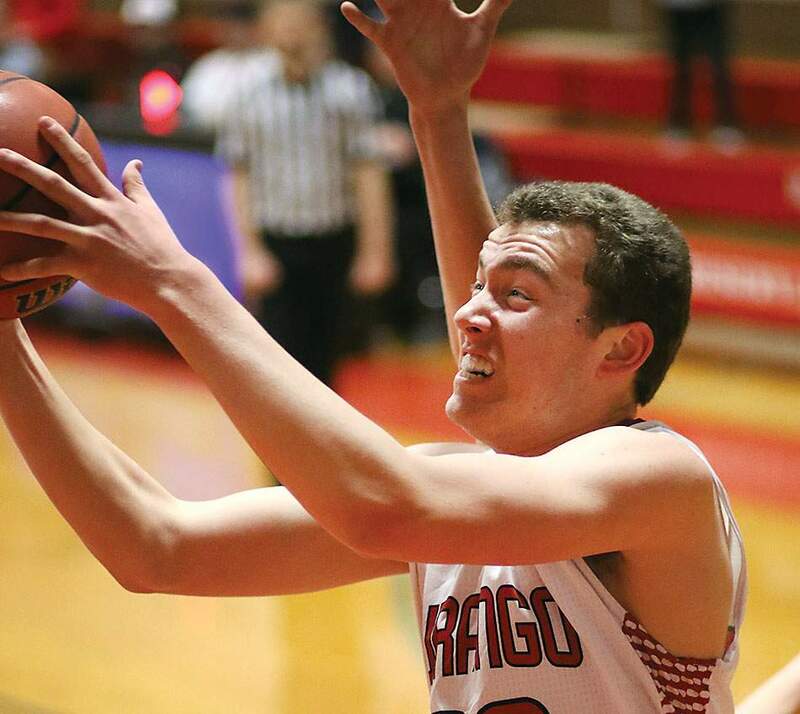 Then, after the locker room talk, Durango’s offense came to life and went on a 10-0 run midway through the third quarter, only to give up a 9-0 run of its own, as Montrose held a 1-point lead, 35-34, heading into the fourth quarter. Montrose (9-7, 1-0 SWL) was led by freshman guard Luke Hutto, who scored 15 points, had five 2-point shots, and went 5-of-8 from the free-throw line, including 3-of-5 down the stretch. In addition to Cuntz and Hurworth, DHS also got contributions from Flint, who finished with eight points while Cullen Robinette had six. The Demons will travel to Bloomfield at 7 p.m. Tuesday at Bloomfield High School for its final non-conference game of the season.